About Instructor and Performer Daisy - Islamorada Barefoot Dance Studio provides Fire Eating, Fire Dance, Polynesian Fusion Luau Fire Show, and Bellydance Entertainment for Weddings and Event. Hi! My name is Daisy Ellis and I began taking beginner, intermediate, and advance bellydance certification courses in 2006 with International Bellydancer, Shayna Lee of Hipnotic Dance Studio in Cutler Bay, FL. The only dance experience I had was in ballet. I was so mesmerized and dedicated to this new art form that I traveled from Tavernier to Cutler Bay for classes, rehearsals, and events. As I advanced in the classroom I was recruited to be part of the performance troop, Shayna and The Snake Charmers. We were a group of 12 with elaborate and fascinating choreographs performed at a lot of community festivals and events. My favorites were Joharah International's Hafla and the Miami Bellydance Convention with workshops taught by Master Instructors and vendors selling gorgeous professional costumes, props, jewelry, and music. This was also the place to show off your work and really stay up to date with what's going on in the bellydance world which is quite big since it is a world wide cultural dance. Once I had attained my certifications I became a teaching assistant. Soon after and with the assistance of my home studio I began substituting for local bellydance studios including my instructor's classes. My home studio also assisted me with getting started with restaurant performances. I was approached by a restaurant in Tavernier, FL called Country Gulls that had Friday and Saturday Greek Night. I became their House Bellydancer and I gave myself the name Florida Keys Belly Dance. As Florida Keys Belly Dance I also took over a group of students taking classes from Avril, Tribal Bellydance Instructor and Performer while she was traveling. I was hired as a Bellydance Instructor at Miami Dade College and I know have my own troop in Key Largo called Florida Keys Belly Dance Troop. I finally had my own choreographed sets that my regulars loved and I was ready to move on to professional platforms like the stage and contracted events referred to as gigs. Immediately I started going on professional gigs with my instructor and taking notes. Working on my advertisements for gigs was easy because I had a great portfolio, restaurant performance videos, and professional studio pictures I jumped on when my instructor did hers for a better price. Since 2009 I have been contracted to perform at wedding receptions, sweet sixteens, grand openings, fundraisers, princess parties, birthdays, baby showers, bridal showers, and anniversaries. My prices are standard and a professional with quality production will not be able to drop her price. A performer who is in high demand may also need to increase her performance fees. When booking a Bellydancer you should look at their videos. Professionals will have full videos of their performance or at least long enough clips that give you an idea of what your getting. There is a big difference in an instructor that challenges you and one who holds you back. If your instructor says your not ready it doesn't mean he/she's holding you back. Leave yourself open to listen for what you need to be ready for the next step. A great teacher will encourage you and give you the tools you need to succeed. My home studio has been great at guiding me and helping me to avoid pitfalls. It is also a great and honorable title in the world of bellydance to create great bellydancers to represent the Art of Middle Eastern Dance. They are referred to as Master Instructors. It is imperative that you take certificate courses which provide a list of moves and vocabulary. Why take certificate courses? Most teachers will accept certificates from well known instructors to sign up for their advanced courses. It's true that most workshops don't require a certificate. They are a free for all and you are free to keep up as best you can. However, you will be getting the most out of these workshops if you have a good foundation. At this point I'm looking to challenge myself by competing in 2017. Dancers have different reasons for competing. I'm interested in the process more than the placement. Competing is also a great way to get exposure and hopefully get invited to teach workshops at other studios. I am an independent business woman and mother of three. My husband is my business partner, best friend, and my Bellydance Manager. In a world in which you are constantly competing with men and having to man up sort of speak, it is wonderful to be part of the feminine world of Bellydance. I found my self accepting and loving my body just the way it is. I bellydance when I'm fat, when I'm fit, when I'm bloated and guess what? I'm going to bellydance till I throw out my hip! I've also noticed that the minute my dancing schedule slows down I gain weight, but I don't freak out about it like I use to. I love that! My favorite instruments in bellydance music (Middle Eastern music) is the drum and the flute. I've always preferred live music and entertainment to a recorded experience and it is even more so with bellydance for me. Even though I love all sorts of bellydance styles and props my major draw is the drum solo. This is a performance where the drummer and the dancer are synced into each other. These are the things that drive me to Bellydance. 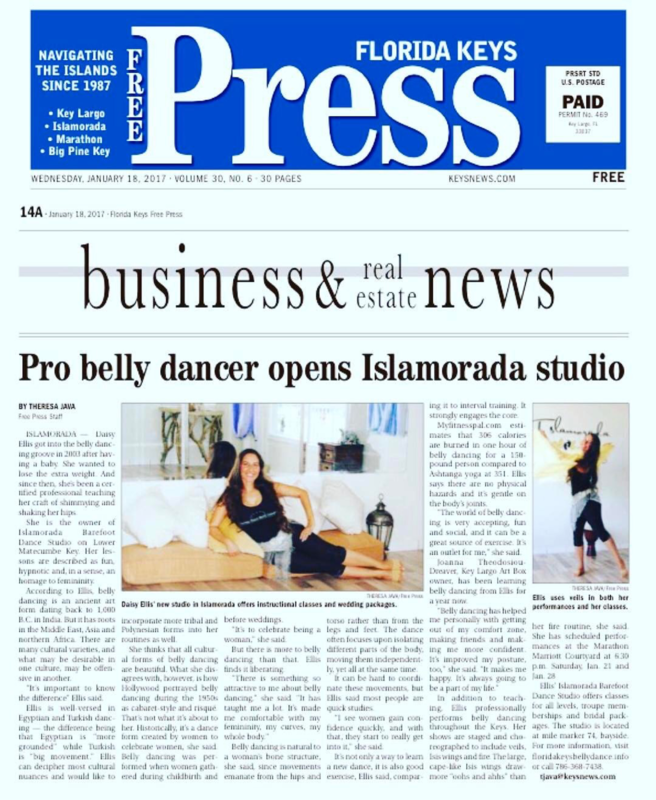 In December of 2016 I opened Islamorada Barefoot Dance Studio. I've always wanted a studio space of my own to practice and I couldn't have found a better space. I have an amazing view of the ocean. I teach belly dance and Polynesian dance classes. The studio will cater to bridal parties visiting Islamorada in The Florida Keys and locals looking for fun fitness activities. I took Middle Eastern drumming and rhythms courses at Miami Dade College in hopes that I would one day work on a drum solo of my own. Opportunity knocked when I met a percussionist named Nadav who lived near me. Together we came up with a drum solo that I could teach to my beginner/intermediate students in just a couple of months. We were contracted to perform at private events and we took it to the stage of the 2014 Miami Bellydance Convention. I was also able to share our work with the Southernmost Bellydancers in a workshop I taught at The Coffee Mill Dance Studio in Key West. They are a fun group led by Judith Cisneros and her daughter Zuri Ma. George Parker teaches hand drumming in the Upper Keys and has a Middle Eastern rhythms vocabulary. I join in on his jam night sessions which is a great time.